The Saudi Arabian Al Fahd 8×8 Wheeled Armoured Personnel Carrierd is a landmark for the Armed Forces of Saudi Arabia as their first indigenously developed and manufactured armoured fighting vehicle. 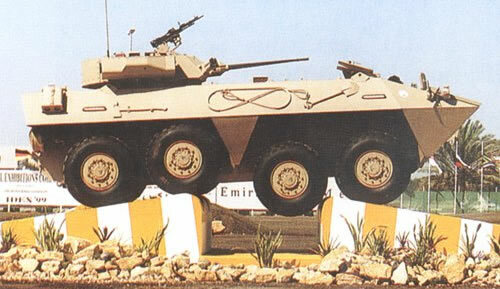 Developed by the Abdallah Al Faris Company for Heavy Industries, it is manufactured in two variants, each having some unique features but also sharing some common ones. The vehicles are all built from high alloy single steel sheets with layers of multi-Kevlar material for extra protection against large calibre weapons. It has air-conditioning and Nuclear Biological Chemical air filtration protection systems for the crew and troops. Whilst driving on roads only the middle four wheels are powered and steered, and the maximum speed is 90km/h, whilst off-road driving all wheels are powered and steered. The vehicle is able to negotiate slopes up to 80%, side slopes to 55% and cross trenches 2.5m wide. It uses a hydrogas suspension with a nitrogen springing medium, allowing greater off-road speed and performance. The vehicle has a ZF 6WG-200 powered gearbox by Zahnradfabrik Passau GmbH. The fuel capacity of the two vehicles is the same. A hydraulic amphibious system is available as an option. The maximum amphibious speed is 8km/h. The hull is water-sealed and airtight. The 400hp Deutz 10-cylinder engine is in the front of the vehicle with the driver. The rear is the troop compartment, which accommodates 11 troops. They exit the vehicle via a large ramp in the rear. It can be fitted with a small turret for mounting weapons of up to 40mm in calibre. It has an operational range of 800km’s. The vehicle uses a 500hp Deutz 10-cylinder engine, which is set in the rear of the hull. It has an operational range of 600km’s. It has a four man crew and a two man turret, which can be fitted with weapons of calibres up to 105mm, allowing the vehicles roles to double-up to that of fire support. 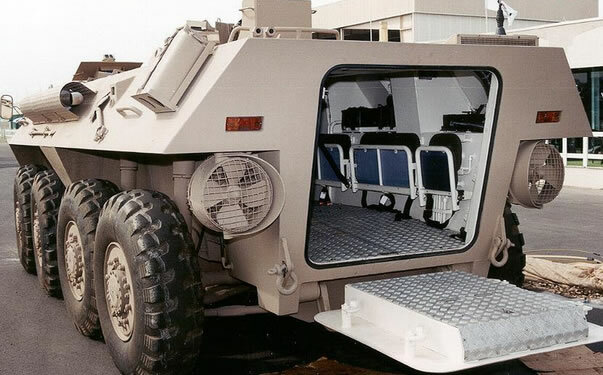 The Al Fahd armoured vehicle has been developed by the Abdallah Al Faris Company for Heavy Industries, which is based in Saudi Arabia at Damman, just north of Dharan near the coast of the Persian Gulf. Both variants entered production in 1998 and a total of 100 vehicles have now be delivered to the Saudi Arabian National Guard, who are part of the Armed Forces and serves both as a defence force against external threats and as a security force against internal threats. According to Pakistani Military forums the vehicle is reported to be in service, however there is no pictures nor numbers in service.